When we started our Case Management adventure the Case Management Model and Notation (CMMN) standard was still relatively new and unknown. (May 2014 the official 1.0 release was released). 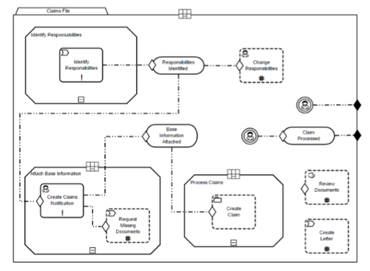 Both our design tool (Enterprise Architect) and implementation software (Oracle Adaptive Case Management) did not support the CMMN notation so we created our own “way-of-modelling”. In our teams that means that the process analysts/designers use powerful tools like SparxSystem Enterprise Architect (EA) with its integrated BPM(N) and SOA support. However manually adding text documents describing the relation the specific process or task has in the whole case. You would think that the CMMN notation could easily be integrated in one of the leading architecture and design tools out there. There are some niche products out there that see a market for CMMN modelling like Trisotech, however SparxSystem seems to have no plans at all. Read the complete article here.